THE 2019 SEASON BEGINS MAY 17... SEE YOU IN THE TREES! Have a glimpse of what’s going on at SkyTrek! Looking for a gift idea? What about an adventure?! 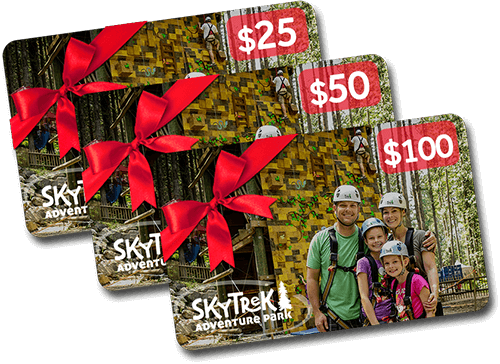 Purchase SkyTrek gift certificates online in a few clicks and get them delivered over email to you or to anybody else. Instant, fast and easy. Quite a cool & original gift! Read customer reviews, no censorship! Don't forget to add your own voice, or just a quick star rating if you're in a hurry! Thanks.